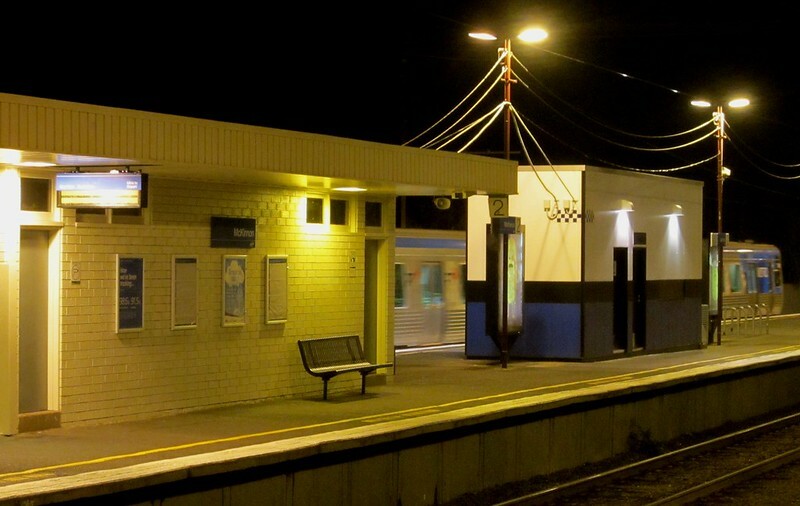 Mckinnon station was the site an infamous incident in 2010 that perhaps, more than any other, solidified popular support for the state Coalition’s policy of two Protective Service Officers on every station after 6pm. It was an unusual event, but very frightening for those involved: passengers coming home from Friday night football. Passengers had to fend for themselves for several minutes as the train sat idle while a mob brandished broken bottles and hurled rocks at the windows. Passengers who were attacked by a group of youths have questioned why they had to defend themselves for so long, only for the train to move on once police reached the scene, carrying away dozens of potential witnesses with it. I would think it’s entirely likely that the presence of PSOs would have nipped this in the bud, or prevented it from happening entirely. So it’s significant that Mckinnon’s PSO pod looks to be complete. There might be internal works going on, but I won’t be surprised if PSOs start duty there soon. As I’ve written before, the anecdotal evidence is the increasing presence of PSOs is increasing public confidence in the railway system at night… but it’s not clear if this is translating into increased patronage. Time will tell if this and other measures help (a few years ago, evening trains on this line went from 30 to 20 minutes until about 10pm, for instance). There’s still an argument to be made that security around stations is better and more cost-effectively served by fulltime regular staff, backed up by a rapid response force that can be quickly deployed when required, along with a fulltime security presence at hotspot stations where security is a genuine concern, as well as more patrols on the trains themselves. Meanwhile, PIDs (Passenger Information Displays) are also appearing at Frankston line stations. Bentleigh got them last week (on the main two platforms only; not on little-used platform 3), and as you can see in the picture, they’ve also been installed (but are not yet running) at Mckinnon. Hopefully this will be part of upgrades at every station along the line — it is likely to be of more long-lasting benefit than the lick of paint stations are getting. At Bentleigh the PIDs is a nice accompaniment to the “rainbow” network status board, though notably the Smartbus sign just outside the station still isn’t showing train times after more than three years. As with all such useful upgrades (particularly the 7-day 10 minute frequencies, but also the improved realtime information) the hope would be that in time it gets pushed onto all the other lines and stations. Of course, truly reliable services, and good, frequent, connecting buses remain elusive. Next → Next post: Can you spot the problem here? Getting home from the station in the dark is also an issue. I have daughters and my wife would not want them to walk home (<10 minutes) by themselves. You have sons (and their mother does not live in the same house) so it is not an issue for you. If the solution is to have a parent pick a teenager up from the station, then in many cases the parents may as well drive them/pick them up from where they are going in the first place. So PSOs are a help but not in many situations. A quarter of a million dollars plus for each PSO bunker is not cost effective. When Southland in up and running, there will be more use of those platforms 3 between Glenhuntly and Moorabbin. This will be even more of the case if they extent peak hour services further into the day and thus run more stopping services on the 3rd track. @Roger, it’s a really interesting topic. I totally accept every family is in a different situation here. Gender, ages, attitudes and personalities of everyone involved, and the local environs, all play a factor. I’ve always been keen to foster a sense of independence in my boys as they’ve grown up. One key thing when they were younger was to ensure they are familiar with navigating their way around public transport – this was achieved by often using it with them. We also regularly take walks after dark (and during the day) around our neighbourhood, which has made them very familiar with it, as well as things like safely crossing the street. Bentleigh is pretty quiet, but you do get a few drunks, druggies and so on in the shopping centre at times. This has been accompanied by regular school activities which have included sending the kids into the CBD on the train and getting them to navigate their way around, doing research for assignments. It’s obvious from looking around the CBD any weekday that a lot of schools do this. I think as they’ve grown older, they appreciate and make use of the fact that they are able to get around independently. They need to develop these skills/smarts at some stage. For this reason, I generally encourage them to go out and do their own thing, and am reluctant to go and pick them up if it’s not really necessary to do so. If I was in the situation where I felt they couldn’t walk home from the station, I think I’d still want them to make part of the trip independently. Also as regards street safety, I’m very conscious that concern which stops people walking after dark feeds upon itself by making the streets more lonely at night. Some interesting reading on this Reddit discussion thread: Do you feel safe walking in your neighbourhood at night? I take the train at night to/from work or uni four nights a week and get picked up from the station by my dad. The argument that parents may as well just drive their kid to where they’re going doesn’t always apply. My dad is more than happy to drive five minutes to get me, but as a diabetic who goes to bed early for his own job, he’s not willing to drive the twenty minutes to my work. I too wouldn’t want to walk home from the station in the dark but the PSOs often hang around until they see my ride has arrived and I’m safely in the car. My home is between McKinnon & Bentleigh Stations & will have to walk through Nicholson Street to get home. My family & I feel very unsafe to walk home after dark as the dimness of the streets is just haven for any potential crime to take place. In fact most streets in McKinnon & Bentleigh are just too dimly lit therefore encouraging criminals to act. Many issues of ‘Street Watch’ highlighted burglary, theft, robbery, vandalism etc in Bentleigh & McKinnon area & the most recent is in 5th & 12th of August’s issue. I feel that if streets were better lit, they’ll be more lively & people will feel safer walking in them and probably many crimes can be deterred & prevented.